When our little cherubs are two or three years old we feel relatively little pressure to educate them. We feel confident that Dr. Seuss and Sesame Street are giving them all that they need by way of life experience. But then they turn four or (gasp) five and we tend to freak out a little bit. Suddenly we seem convinced that we’re not doing enough for little Johnny, that they’re going to fall behind, that they’ll never get into college … or something. Parents seem panicked to make sure their very young children master the building blocks of learning. Matching games, tracing patterns, sight word flash cards, spelling bingo, arts and crafts to fill a decade of cut and paste potential. And I sort of get it, I do. But at the same time I sort of don’t. 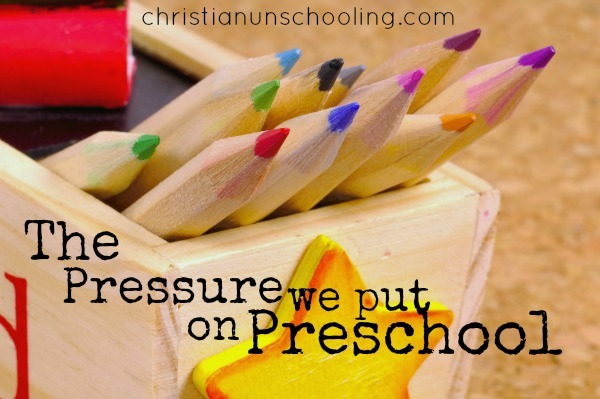 Of any age range I can think of, the “preschool” age is probably the time when our children need the very least push to absorb and learn. I mean, have you met a preschooler lately? Calling them “sponges” is an understatement. And generally they still have the advantage of having never been “schooled” so they have no stigma attached to learning. My preschooler (who is four years old) has never had a formal lesson in his life. Honestly, we’re not even very crafty around here. He spends most of his time playing with Legos with his brothers. Hours and hours of Lego. We haven’t “taught” him to read or write or spell. And yet, when I picked him up from Sunday School class at church this past week, he was the only preschooler in the entire room that had written his own name on his paper. Do you know how he learned to write his name? By seeing his name in text so often when playing video games. And simply memorizing it. That’s it. No lessons, no practice or pressure on our part. No fancy printable tracing letters from a fancy printable preschool website. He’s just a sponge. Who took the time to learn his own name because he wants to, because it’s his name and he takes pride in it and he enjoys learning new things. Not because we doll it up and make it fun for him. Just because the real reward in learning is the unpressured joy in learning itself. I’m not saying there’s anything wrong with printing fun activities and crafts for your preschooler. Not at all. There are a lot of wonderful resources out there that simply weren’t available to former generations of homeschoolers. If you and your little person are having a blast then keep up the good work. Just don’t panic. Don’t feel that you have to do so many forced “educational” activities with your very little one. Don’t let the pressure of mastering the basics stress you out. Preschoolers eat and breathe the basics. If you create an environment of creativity and availability your preschooler will pick up the skills they need simply by living. Don’t underestimate the power of simply living.